Frank Lloyd Wright is an American legend, known for his unique style of architecture. Notable works include Fallingwater and the Guggenheim Museum. 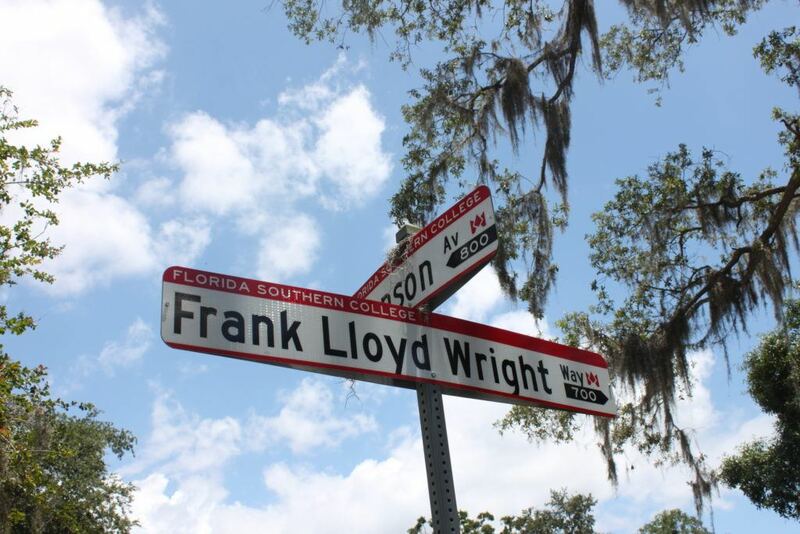 While most of his work is found in Pennsylvania and Illinois, there are also Frank Lloyd Wright structures around the South, in part because of the planned houses sold later in his career. Some even came with furniture. Sadly, some are no longer around. The Louis Sullivan Bungalow in Ocean Springs, Mississippi was destroyed by Hurricane Katrina and the Welbie L. Fuller Residence in Pass Christian, Mississippi was destroyed by Hurricane Camille. 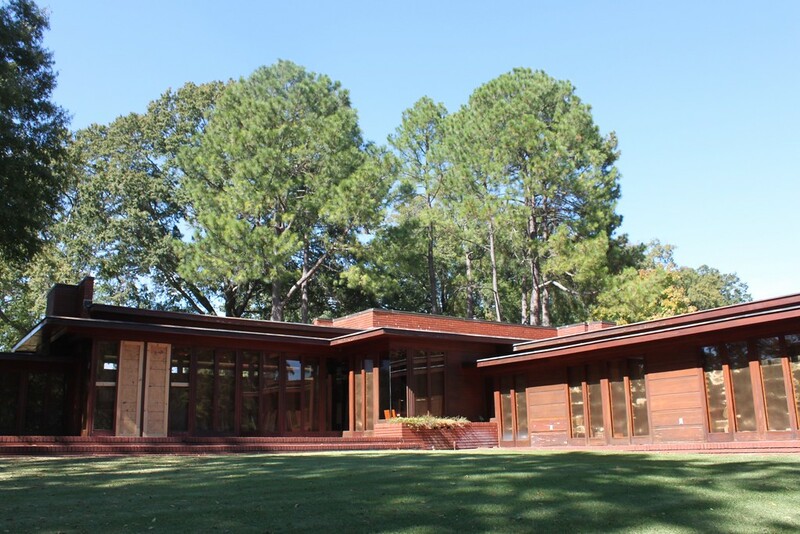 Florence, Alabama, in an area known as Muscle Shoals, seems to be a surprising place for a Frank Lloyd Wright home, but the Frank Lloyd Wright Rosenbaum is one of the few in the region that is open to tours year-round. Stanley and Mildred Rosenbaum commissioned the home after reading about Wright in 1938. It was based on the Usonian Jacobs House in Wisconsin and is only one of 26 constructed before World War II. 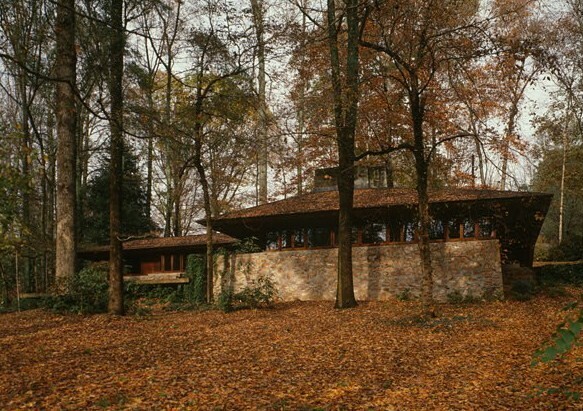 It has also been called “the purest example of the Usonian” by scholars. The L-shaped home sits on two acres and is made primarily of cypress with cantilevered roofs that bring in as much of the natural surroundings as possible. It also has Wright-designed furniture. After the last family member moved out in 1999, it had suffered water damage and termites but was repaired and opened as a museum in 2002. Perhaps the best opportunity to see Wright’s work is at the Frank Lloyd Wright Visitor Center. The campus in Lakeland is open to tours, either self-guided or guided. Start at the visitor’s center, which has information on Wright’s life, before exploring the unique buildings, which are the largest collection of his work in the world. The president of the university recruited the famed architect in 1938 for what’s known as the “Child of the Sun” campus. Among the school’s highlights are the Annie Pfeiffer Chapel, pictured, the Buckner Building, formerly the Roux Library, and The Esplanades, which were all constructed between 1938 and 1958. Originally built in Falls Church, Virginia, the Woodlawn & Frank Lloyd Wright’s Pope-Leighey House now sits on the grounds of Woodlawn Plantation. Commissioned in 1939 by journalist Loren Pope after a chance meeting with the architect, the home was one of Wright’s Usonian L-shaped homes and was later sold to the Leighey family in 1946. In an effort to save it from highway expansion, the home was relocated to Woodlawn, where Mrs. Leighey continued to live until her death in 1983. In 1995, it was moved again because of erosion, but just elsewhere on the property. Originally built in New Jersey in 1954, the Bachman-Wilson House was moved to Crystal Bridges Museum of American Art in Arkansas. The Bachmans hired Wright after Gloria’s brother studied with him in Arizona. It’s one of the few that has two levels as well as unique Native American designs. It fell into disrepair until it was purchased in 1988 and restored to the original design. Later at risk of flooding, it was purchased by Crystal Bridges and moved. Today, it’s open to tours and a part of the museum facilities. Set outside of Beaufort, Auldbrass Plantation is technically privately owned, but opens to tours every two years. Tickets go quickly, but this is the only way to gain entry. It was a farm as early as the 1700s along the Combahee River. The modern plantation, including the house, stables, and kennels, were designed and built by Frank Lloyd Wright from 1940 to 1951, who is also credited with giving it the name for original owner C. Leigh Stevens, an industrialist. Film producer Joel Silver purchased the home in 1986 and restored it after encouragement from Frank Lloyd Wright experts. In addition to those open to visitors, there are another six that are private residences that you might be able to see from the outside. 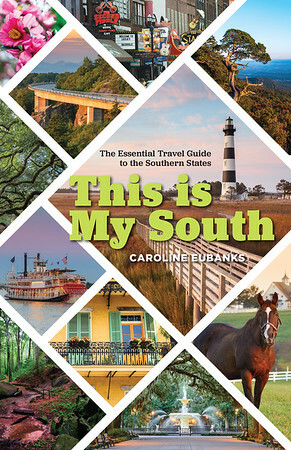 The Zeigler House in Frankfort, Kentucky; Fountainhead in Jackson, Mississippi; Broad Margin in Greenville, South Carolina; the Luis Marden House in McLean, Virginia; and the Andrew B. Cooke House in Virginia Beach , Virginia are a few examples. And the Seamour and Gerte Shavin House in Chattanooga, Tennessee was, as of 2017, the last of the Frank Lloyd Wright homes to be inhabited by the original owners. 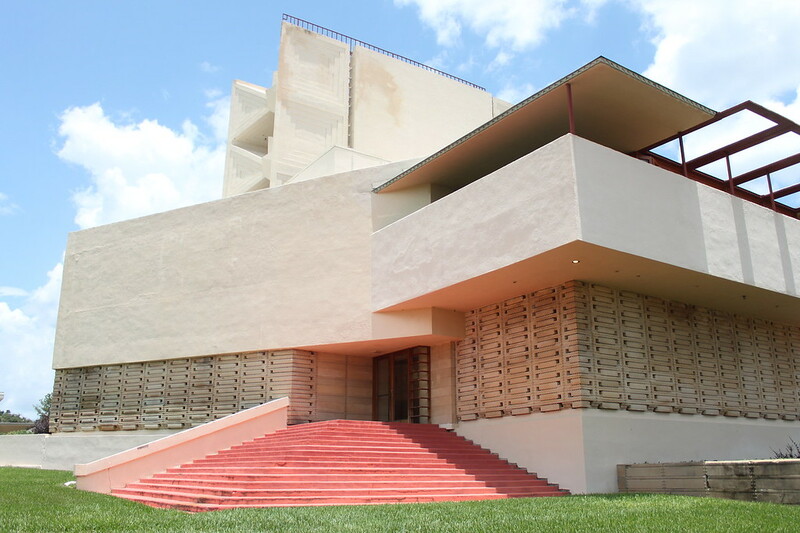 Have you been to any of these Frank Lloyd Wright buildings and homes?